The Temple Beth Sholom Judaica & Gift Shop offers a full range of Judaica items to meet your gift, holiday and everyday needs. Our beautiful selections range from the traditional to handmade works of contemporary art by Israeli and American artists. In addition, we feature a complete line of gifts, jewelry, cards, personalized invitations and paper goods. Our Judaica Shop is sponsored and run entirely by volunteers of the Temple Beth Sholom Sisterhood. These knowledgeable volunteers are delighted to assist you with all your Judaic needs. All profits go directly to the Sisterhood, which, in turn, contributes to the many functions and programs held at the synagogue. In addition, Sisterhood makes available funds for scholarships which are used to help families pay for religious school and enable children to attend Jewish summer programs. Tallitot and kippot for men and women of all ages, as well as Bar/Bat Mitzvah invitations. We can order special kippot for all occasions. We have a beautiful selection of items for your home: candlesticks, Kiddush cups, tzedakah boxes, mezuzot, and more. Whether it is Rosh Hashanah, Chanukah or Passover, our gift shop can meet all your holiday needs: we carry dreidels, matzah boxes, groggers, Seder plates, and more. Our Book Corner has a wonderful selection of books for children and adults. Please drop by to view our display cases featuring the beautiful selections that we have in stock. If you don’t see what you want, please let us know and we will be glad to order it for you. 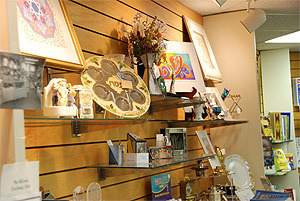 The Judaica Shop is located in the lobby of Temple Beth Sholom.